Home » Socks Proxy » Does Artica Proxy is sFTP compatible ? Does Artica Proxy is sFTP compatible ? 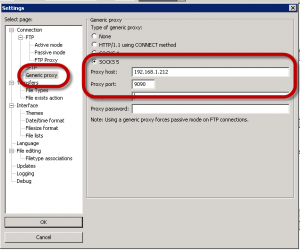 The main proxy is only compatible FTP/HTTP/HTTPs. If you plan to use Artica Proxy in order to provide sFTP support, you need to enable the SOCKs Proxy service. The Socks proxy service allows you to proxify any protocol such as sFTP. Many FTP softwares are SOCKs compatible.